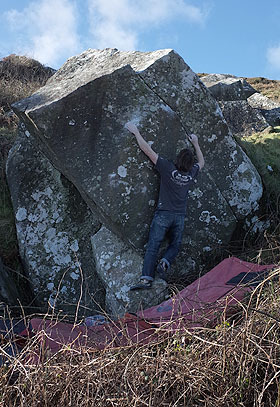 On Saturday Si Panton paid a visit to Clwt y Fiaren, the recently developed cluster of boulders on the Hell’s Mouth side of the Mynydd y Graig ridge/escarpment at Rhiw. 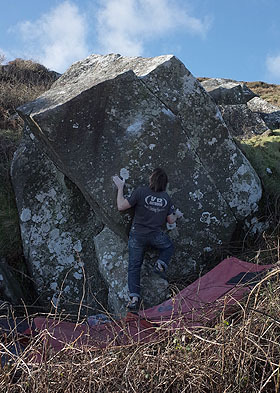 Although still retaining a touch of dampness from the previous night’s rain the rock soon dried and excellent conditions prevailed. A possible weakness to the right of Owen Hayward’s superb Berried Alive caught Si’s eye. After some experimenting a useable sequence emerged, and shortly after a successful ascent. 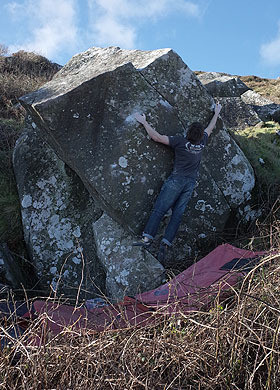 Berry Head 7A starts standing just right of Berried Alive (left hand: sloper, right hand: low edge/sidepull notch). 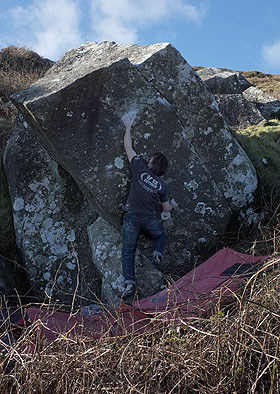 Balance up to some poor holds on the ramp then somehow gain the sloping right hand arête. 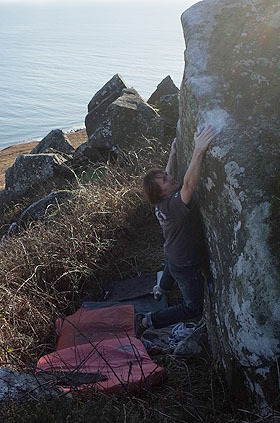 If successful lurch back left to the notch in the lip and top out at the rounded apex of the boulder, or, better, out left from the notch as per Berried Alive.